Overnight I saw quite a few tweets spinning off an article 'How to Lie with Data Visualisation'. Initially, I mistakenly thought this had been written by Aatish Bhatia but it was actually from Ravi Parikh. It is a good article picking up on some of the classic subjects of our ire (Fox News, truncated y-axes). I did, however, disagree with the inclusion of this graphic produced by Reuters. I couldn't see the 'lie' demonstrated by this graphic that would force it to join those others on the naughty step. For me to read it I look at the more red equals the more deaths. Focusing on the shape of the colour rather than the passage of the line reveals the changes over time and the y-axis labels support the fact that a higher vertical position means a lower count of deaths. Once again, for me, it was clearly just an upturned area chart used to achieve the metaphor of a blood effect, and likely inspired by the below graphic produced by Simon Scarr (then of the South China Morning Post now of Reuters). Simple, right? Well, not necessarily. The response on twitter through some good discussions has largely been supportive of the article's stance and less so on my seemingly contrarian view. (I feel like I've been here before...). So here's a few further observations and thoughts. (1) I think a key discussion here is the distinction between confusion and deception. I'm not going delve too much into the semantics of language definition but my sense of the difference is that 'deception' is generally something you knowingly intend, 'confusion' is a by-product effect of something not being clear. I'm not necessarily defending or celebrating this particular graphic, I'm really remarking that, unlike some of these other cases, there isn't anything in my experience reading the graphic that felt like deception. This was further reinforced by seeing a reply from the designer, Christine Chan's, to a question about the graphic. (3) The issue of graphical literacy is incredibly interesting and important. The ability to read and interpret chart types is something we are not trained to do. We 'get by' through experience, practice and exposure. Some people find different charts and graphics easier to read and interpret than others so there is rarely a common experience. As designers, our objective has to be to try help overcome any obstacles people might experience in the readability of our representations, either through our design choices or through explanatory annotations. I will be posting much more about one of my current projects working with a research team hosted at University of Leeds to explore this matter of graphical literacy amongst the general public. (4) On a similar matter, I include the Iraq graphic in most of my training workshops (and it is admittedly in my top ten graphics ever). I am therefore especially familiar with and potentially more primed to 'get' a graphic that uses a similar device of the upturned dribbling blood effect without it having any misleading impact on me. (5) Some great points were made about the effect of the area chart's colours creating a figure-ground illusion that means we can naturally be drawn towards the dominant shape of the 'white' area chart (and in the upward direction we normally might expect an area chart to be directed) more so than the big area of colour. I didn't experience this but clearly others have, particularly likely caused by the x-axis labels being at the bottom of the chart (thus almost framing the 'white' area chart). In contrast, several mentioned that the bar charts in the Iraq graphic almost 'punctured' this figure-ground illusion and had the x-axis labels across the top. Anyway, here is a storify'd collection of responses. It in an interesting discussion to sustain I think. What makes that chart deceptive is the inclusion of a thick baseline at the bottom, and the gridlines, I think. It took me a minute (almost literally) to figure out what I was seeing. That didn’t happen with the China Morning Post’s one. Semantics I know, Alberto, but I still don’t see that as deceptive. Misleading/confusing, yes perhaps, but as I suggest in this post, ‘deceptive’ implies malintent which clearly, as Christine explains in her tweet, is not at the heart of this design shortcoming. It is misleading in it’s exclusion of information. The 90’s and 2000’s potion of the chart are out of proportion to the 2010’s. It should be graphed by year. The original China chart also included other information on why there was a down or up shift in the numbers. This chart only includes one piece of information which leads you to the conclusion that the author wants you to have, not the one that the information may give. The other thing that I think makes the gun murders graph (arguably) deceptive is that it implies, by the choice of what measures it implies a causative relationship between the enactment of SYG laws and handgun murders which may or may not be there. It might be that the rate of handgun murders in Florida rose for any number of reasons, including that there was an upswing in population (which is why crime stats are usually presented as a per capita number). 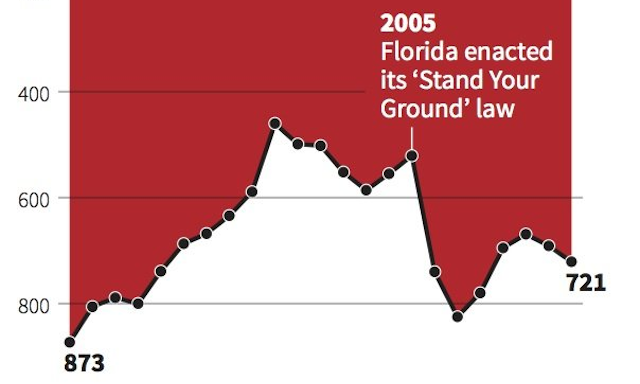 Tangentially, I happen to know that Stand Your Ground laws are invoked in only a very small number of murder cases, and are invoked successfully in an even smaller number, so the suggestion that the change in murder rates in Florida is attributable to to the enactment of the law is clearly misleading. Whether it’s deliberately so isn’t something I can speak to, but when we’re presenting data for public consumption it seems to me we have a certain obligation to consider such things and, at the very least, to be clear about the limits of the data we’re presenting. I don’t see why authorial intent is important here. Authorial intent died in literary criticism over 100 years ago — the text is the text, simple as that, and the author’s intent is irrelevant. The text, or in this case, the graphic, is its own entity in the world. The graphic is the sole source of meaning and the *interpretation* of the graphic is what’s really significant. Just like the FoxNews graphics, the misrepresentation of the Reuters chart rests on a counterintuitive use of the y-axis. We assume that FoxNews designs their graphics the intent to deceive, which is likely, but we’re not sure. Maybe the graphic artists at FoxNews just wanted to design an “exciting” graphic with a dramatic difference between two data points (similar to the MLB graphic) — maybe their graphic artists are just *bad* at data visualization. Whatever the case, all these graphics take objectively true statistics and represent these figures with graphics that create a skewed or even opposite interpretation, as is the case with the Reuter’s graphic. It looks for all the world as though the Stand Your Ground law decreased gun deaths in Florida. Whatever the author’s intent, the effect is the same — the truth is twisted and readers are deceived. When I looked at this chart, the first thing I saw, probably precognitively, was the heavy line tracing the boundary of the white and red areas and connecting the points. I didn’t really get that the red “fill” of the area was above this line, I don’t think I really even noticed the different colors. I saw the heavy dark line and the year labels along the bottom of the chart, right where I expected a baseline to be. The horizontal line at Y=0, at the top of the chart, is as heavy, but does not stand out against the red fill, so it doesn’t really appear to be an axis. I saw the labels for the first and last points, but didn’t read their values. Kim points out that they are in the negative space outside of the data, which may be true, but they are also on the sides of the points where there is more room for labels. I never really saw the Y axis labels. Am I so totally unobservant to have missed the true meaning of this chart? Are so many of us that got it wrong the first time? I don’t think so. I think that precognitively one sees the heavy data line and the apparent baseline at the bottom of the chart, and don’t rely on conscious cognitive processing to extract any further meaning from the chart. I didn’t know what the excitement was about until I read the critique and looked at the chart a third time. It was only then that I realized that this chart violates the assumptions one makes when seeing such a familiar form. I agree with the comments above. Had the x-axis been put on the top and not at the bottom, people would have seen the Y=0 point sooner and would have better understood the invertedness of the chart, reading it down and right instead of up and right. Although the “blood” metaphor is interesting, I don’t think it works in this case because the data points don’t vary enough like in the Iraq graph. Consequently, the “dripping blood” effect is also much less obvious. As Tammy was pointing out, for this kind of data just using absolute numbers is already a misrepresentation. Demographics should always be taken into account for this type of data. The population of Florida went from 13M to over 19M during that time frame. That makes a huge overall drop from 6.7 gun deaths per 100,000 inhabitants to 3.8 gun deaths per 100,000 inhabitants. The point of a chart or any other graphic is to convey information quickly and efficiently. The average reader can look at a chart accompanying a 2,000-word article and can immediately understand a main point (or more) of the article with a quick glance. An horrendously designed chart does not convey useful information to the average reader efficiently and quickly. If it takes the average reader longer to decipher the meaning of the graphic (“the number is increasing”) than it does for them to read the article then then it is poorly designed. And an article with no chart or graphic is better than an article with a poorly designed one. Instead of discussing the content of the article, which is a big story, by the way, this extremely poorly designed chart has *become* the story! If your supporting graphic becomes a bigger story than the information it was supposed to convey then the creator has done a horrible job of design.